Sotheby’s Paris held their Design sale on November 22, 2016, with gross sales of $5,072,625. Included in the sale were two French glass lamps. 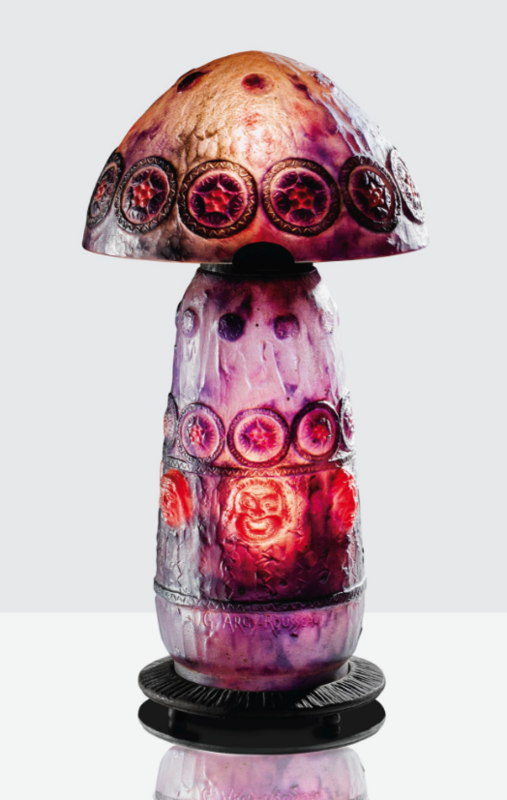 Lot #249 was a Daum Rain lamp estimated to sell for €20,000 – €30,000. It sold for the low estimate of €25,000 ($26,483), including buyer’s premium. I didn’t bid on the lamp because in my opinion the top rim of the shade had been ground down. Too bad, because the lamp had lovely color. 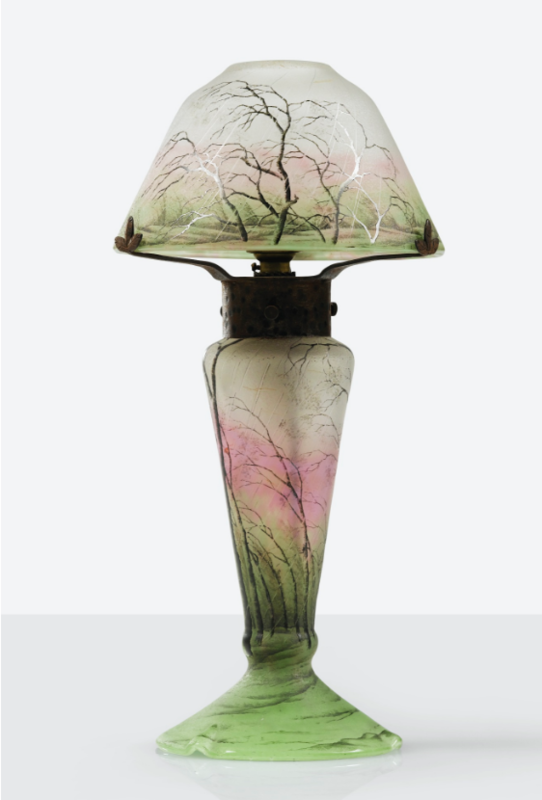 The second French glass lamp was pâte-de-verre by Argy-Rousseau, entitled Tragi-comique, circa 1922. It too sold for its low estimate of €50,000 ($52,966), including buyer’s premium. 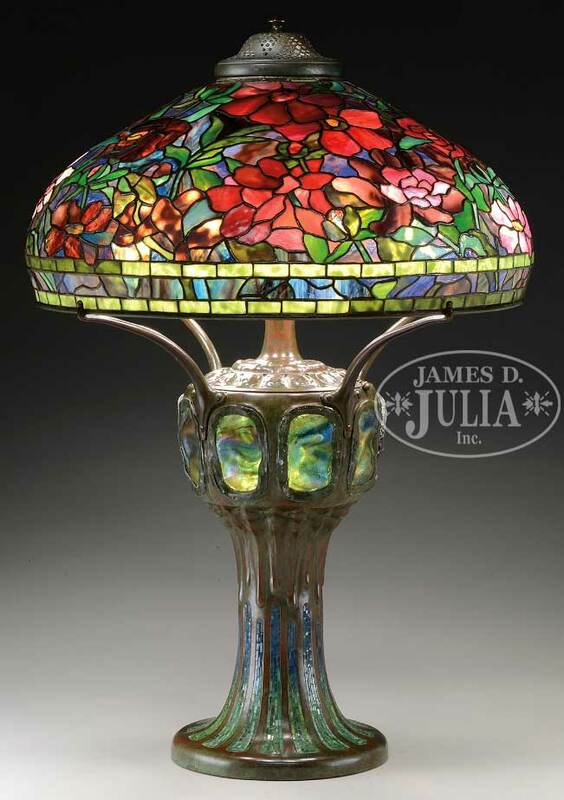 James D. Julia, Inc. held its Important Lamps, Glass & Fine Jewelry auction on November 18, 2016, with gross sales of $3.1 million, a record for the lamp & glass division. 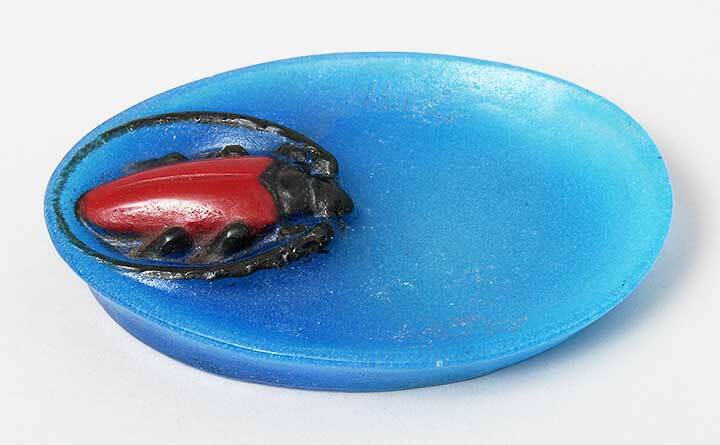 Much of the merchandise offered was fresh to the market from important collections in the Midwest, Florida and elsewhere. 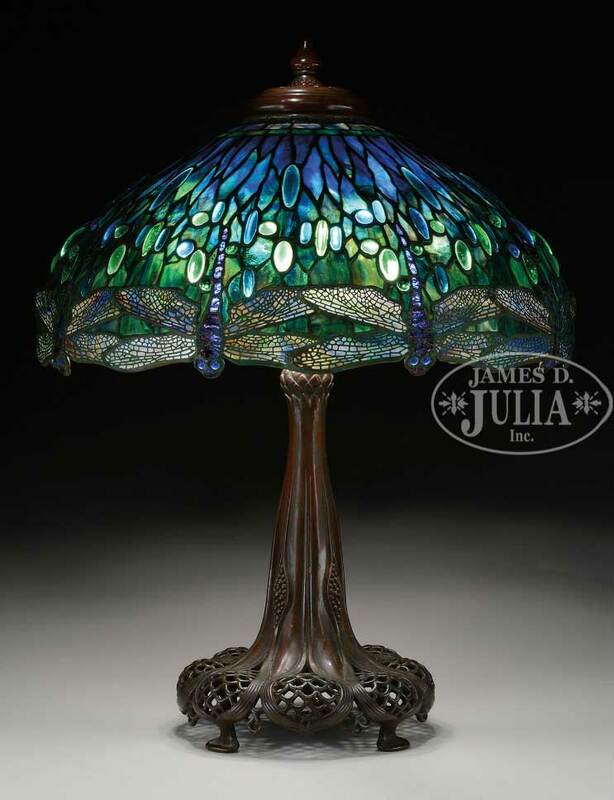 Top lot of the sale and a record for any item ever sold by Julia’s lamp & glass division was #1259, a Tiffany Studios 22″ Drop Head Dragonfly table lamp. It more than tripled its low estimate of $120,000, realizing $515,475, including buyer’s premium. All of the top three Tiffany lamps were consigned from the same Florida collection and all of them were offered with very low estimates and reserves. This was the guidance given to the consignor by the division head, Mike Fredericks, and it certainly was good advice. Each of the three lamps vastly exceeded their estimates and each broke the previous record for any lot sold by the division. As I’ve stated many times before, there is nothing like high quality, fresh merchandise at low estimates. It’s raw meat for the hungry lions. The French glass section of the sale included many fresh, high quality items, which overall did very well. 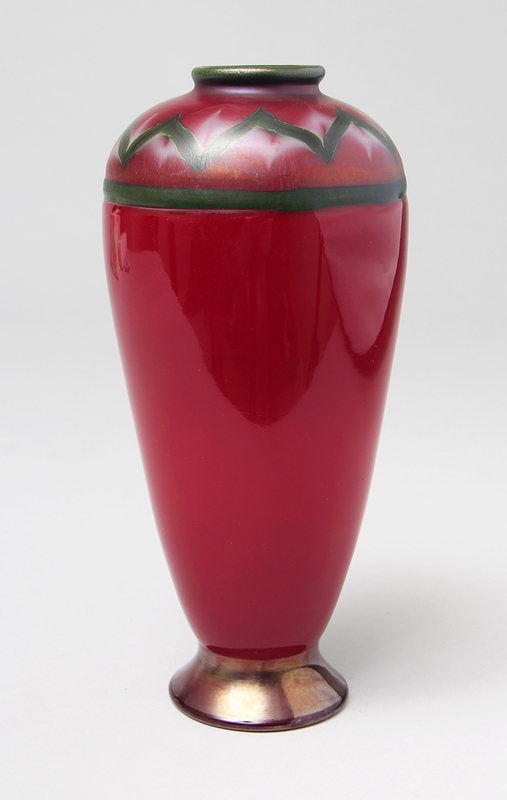 Top lot of this section of the sale was #1058, a fine 17″ Gallé marquetry vase. It sold a little below its low estimate of $50,000, realizing $52,732.50, including buyer’s premium. In my opinion, it would have done better had it been consigned at a less aggressive estimate of $30,000 – $50,000. 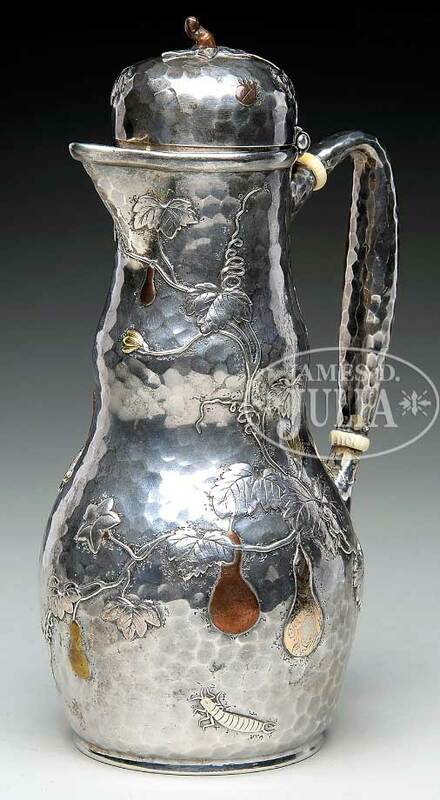 The sale included some nice silver, including Tiffany & Co. mixed metal objects. They were met with enthusiasm, with lot #1409, a mixed metal chocolate pot more than tripling its low estimate of $10,000, realizing $40,290, including buyer’s premium. For the complete results of the sale, click here, but not immediately. The results are expected to be posted sometime on Monday or Tuesday. You will have to sign in (free) in order to see the prices. No more shows in 2016. Our next show will probably be the NYC Big Flea, the weekend of January 21, at the Lexington Avenue Armory. 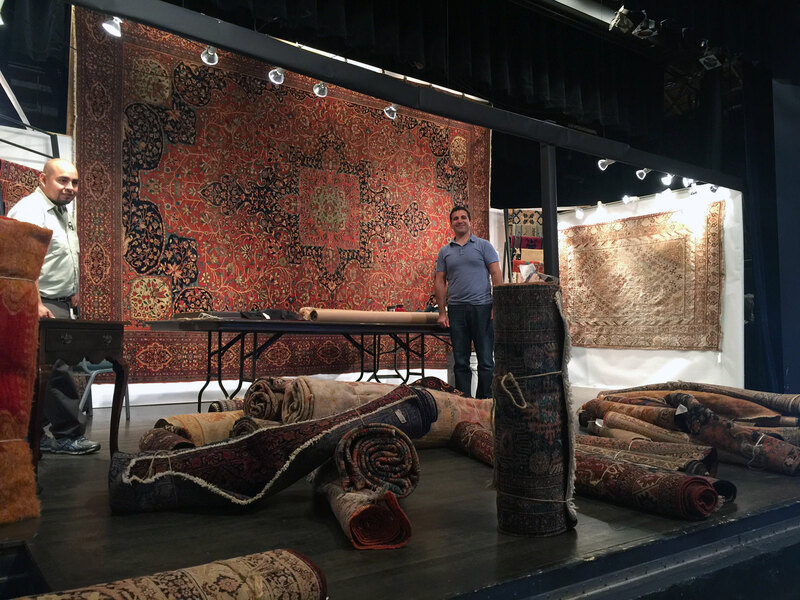 If not, we’ll be in Miami for the Miami Antiques + Art + Design Show, February 3 – 5, 2017. This is the airport show, which will be new and improved, with many additional exhibitors. 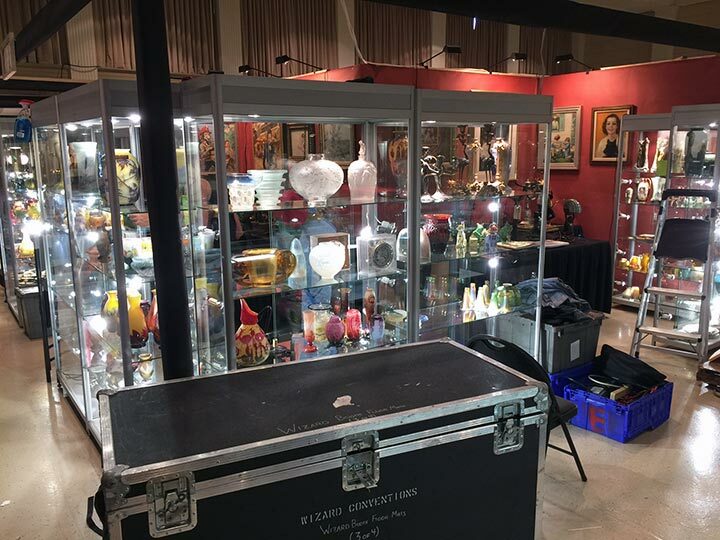 It’s all happening because the Miami Beach Antiques Show will not be at the beach, instead moving to a new location in southwest Miami. It will all make for an interesting winter season. It’s been a while since I’ve listed new items on my website, but that doesn’t mean I haven’t been busy. Just the opposite. Between buying and selling and traveling for business and pleasure, I’ve been too busy to update my listings. But that’s beginning to change. 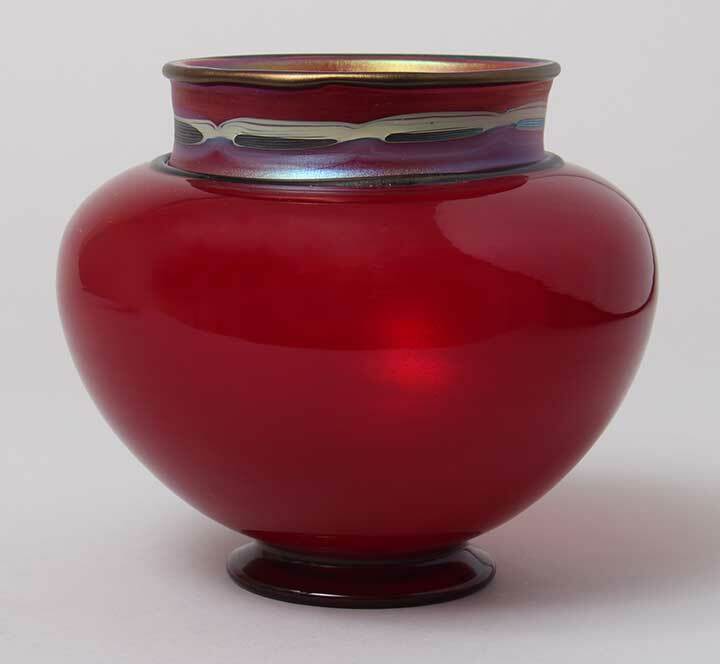 I’ve already started to list some of the great items of French and American glass I recently bought. The Tiffany Favrile glass all comes from the same important private collection that I’ve been buying from for the last few years. Following are just a few examples. Please check my website now and every day, as I continue to add new items. If you’re impatient, please email me, philchasen@gmail.com, and I’ll be glad to discuss it with you. I bought several fine Tiffany Favrile vases from a NYC collection and a 7″ diameter Favrile glass shade and a 4-branch candelabrum from a Washington, DC collection. There are some really great examples here. 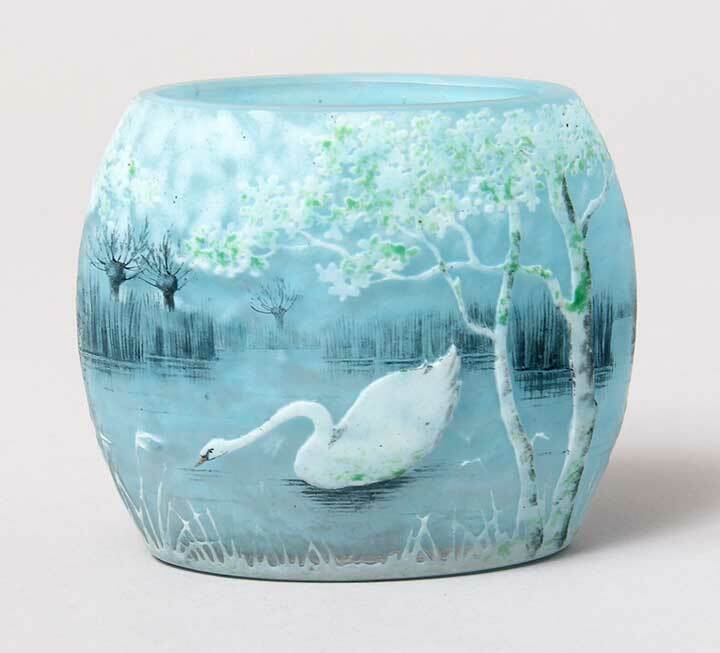 Just this past weekend I bought several very fine Daum Nancy vases, including a very rare Swan vase, a gorgeous scenic vase and a covered perfume. I’ll be listing them all as soon as possible, but right this minute only a few have been listed. I’ll be listing more this week. Please check my site as often as you can. Doyle New York held its 20th Century Art and Design sale yesterday, November 9, 2016. Their sales used to be called Belle Epoque, but the times they are a changing. Most auction houses have switched to newer titles that include the word Design. 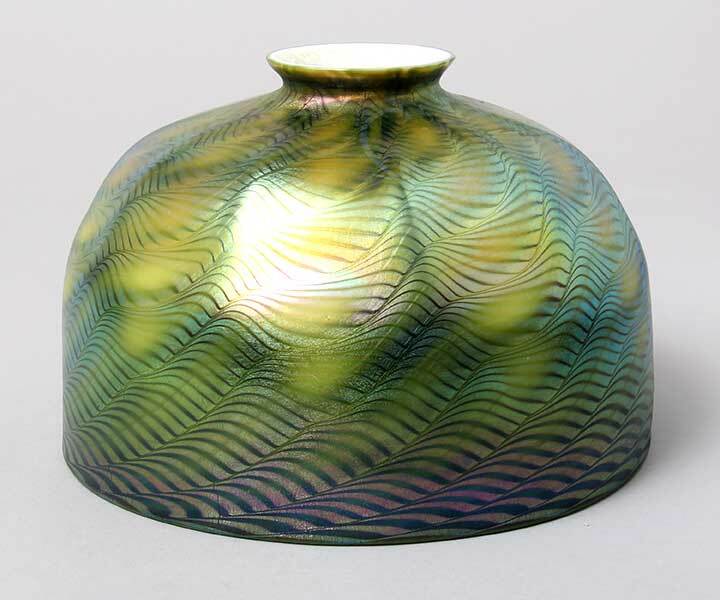 Included in the sale were several interesting lots by Tiffany Studios. 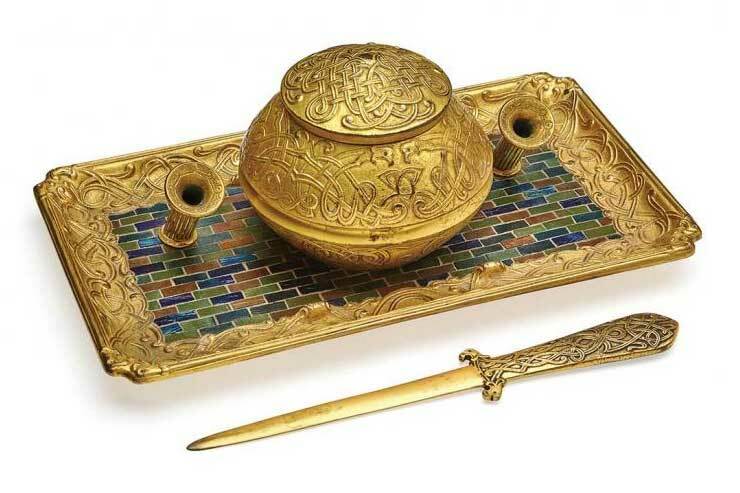 The top lot of the Tiffany Studios section of the sale was #227, a very rare gilded bronze and mosaic inkstand and letter opener. The design was not Tiffany Studios, but rather Marshall Fields. That made sense because the original owner of the set was Potter Palmer II, the son of Potter Palmer, the Chicago business magnate and business partner of Marshall Field. It certainly was a unique special order item. I wanted to buy it, but it zoomed past my top bid, selling for $34,375, including buyer’s premium — an impressive multiple of the pre-sale estimate of $6,000 – $8,000. 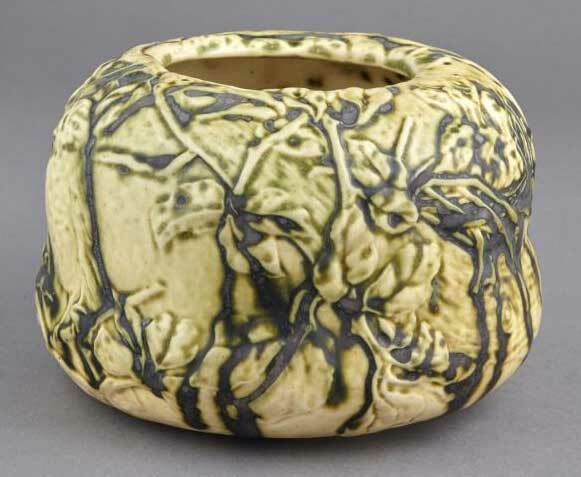 A fine Tiffany Studios pottery vase with bird nest decoration, lot #224, sold for $7,500, including buyer’s premium, well above its pre-sale estimate of $2,500 – $3,500. This was another lot I tried to buy, but couldn’t justify paying the price, which was good for a collector, but not a dealer. I’ve been negligent in listing new items, but that’s already changed. I listed half a dozen new items this past weekend and I’ll be listing more this week. Please check my site as often as you can. Thursday, 8:40 PM. The preview party is almost over and I can’t wait to leave. There has been almost no interest in anything in our booth, except for one half-serious question. As usual, the food and drink has been excellent, but that’s about it. Of course there were no sales, not even close. Attendance was noticeably lighter than previous years, mostly with young women in their 30s. I’m guessing the men were at parties celebrating the Cub’s World Series victory. How about dem Cubs? Here’s hoping the weekend has nothing to do with the preview party. Friday, 1:45 PM. Attendance has been light thus far. Two of our good clients came, but unfortunately didn’t purchase anything. Friday, 5:30 PM. Attendance has been fairly dreadful all day. 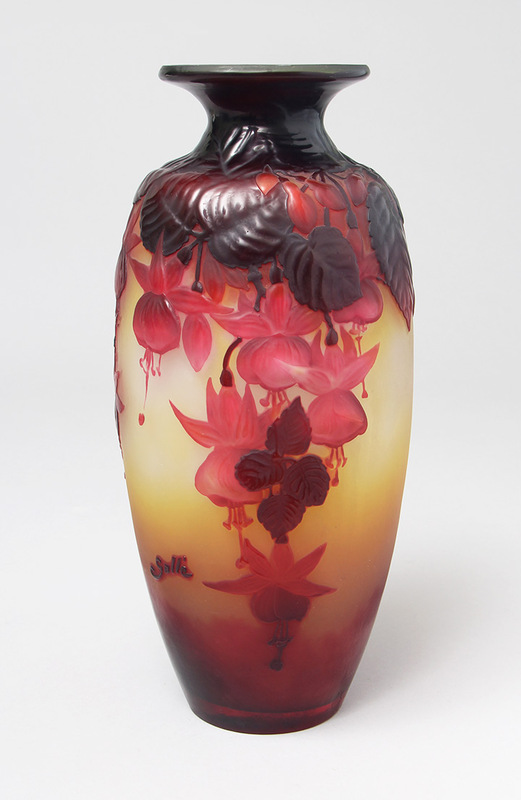 One of my best clients arrived late in the day and bought a very beautiful Gallé Fuchsia blownout vase. Saturday, 11:30 AM. Attendance was very light during the first hour, but it’s picking up nicely. There is no reason the show should open at 10 AM. 11 AM – 5 PM is six hours of selling time and is more than sufficient for everyone to see everything and for the dealers to do business. Two of my good clients were in my booth and will hopefully be back later to make purchases. Saturday, 4:30 PM. Everything improved on Saturday afternoon — attendance, interest and sales. One of our best clients came in late in the day and is considering purchasing several items. We’ll know tomorrow. Sunday, 4:00 PM. The show is essentially over, even though it ends technically in an hour. Nobody is walking around. 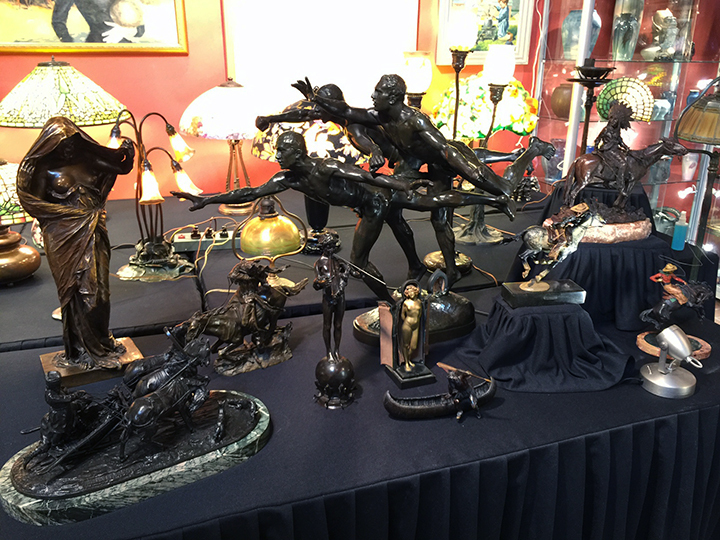 We had a wonderful show, selling bronzes, French glass and American glass. Yesterday’s clients came back today and bought several important items. The only downside was almost every sale was to an existing client. Thank you, we love you, but we also need new blood.